I love flowers in my home. At the moment (and the foreseeable future) I have fake ones scattered about. I don't mind that as they are pretty and very realistic looking. 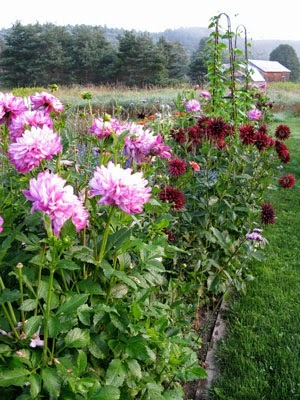 However, it would be so much fun to having a small cutting garden out back to cut fresh flowers from to bring inside. I never even thought about it until this gal suggested it! She's a wonderful gardener herself so it was only fitting that she would suggest it. 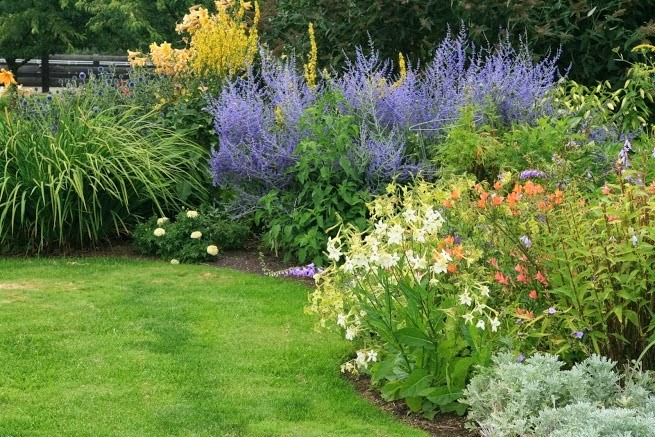 Here are some examples of some cutting gardens that I could realistically see in my back yard. Wouldn't it be fun to just go in your own backyard and cut from a designated area? I would rather do that than take away any decorative blooms from flowers I'm using in my landscaping. Heck, we plant a small vegetable garden every year. It would be nice to include a cutting garden too. Honey, are you reading this? I could even adorn it with a cute sign! Of course, it would be pure fantasy to have a border of lush flowers around the perimeter of our backyard to look like this! But, I wouldn't want to take blooms away from that. So, I'm back to a nice raised bed style cutting garden. I'll have to see. In the meantime, I will dream about it some more. This is too funny that you posted this now. I just wrote down a list of cutting flowers to plant in our raised box out back since we never planted any tomatoes. I would love to have one too, Kelly! It is always so nice to have fresh flower bouquets around the house. It would be wonderful just to step outside and clip a few. testing...Kelly r u getting my comment? That's a great idea! I think you'd love it. I just posted a pic of all the flowers I cut from my garden on instagram. I love going out there to cut a colorful bouquet of flowers to bring inside. Except this morning, I accidentally brought in a spider with the flowers. Lol! Beautiful Kelly...I dream of one too...but unfortunately I would have multiple fences in my yard!...they would be a dessert buffet for the deer! I love cutting gardens, but haven't done one in years. 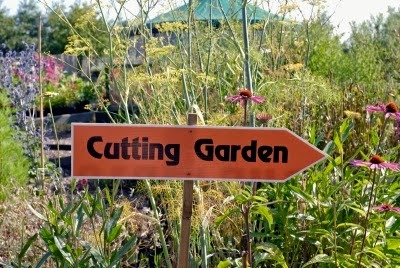 Kelly you probably have the perfect weather for a cutting garden. How awesome would that be to go out and cut your own fresh flowers. I could see you with a cute sun hat, cute french flower basket!!! I say go for it. You found some great inspiration. Kelly, I am SO with you on "garden dreams!" it's right up there next to "covered porch dreams!" I even bought a big picture-heavy book about porches yesterday - told husband it's my inspiration tea table book till the dream becomes a reality. Without our dreams where would we be? I wish I had more space here, I would put one in for sure! It's not that hard..Just plant a lot of flowering plants that bloom at different times..I don't give a lot of thought to it but it seems to work.. Sounds like a great idea Kelly! Very doable. I get flowers from my hydrangea mainly because I want to dry them. A cutting garden would be nice. 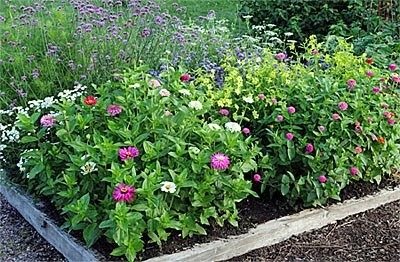 The border of lush flowers is my favorite though, bet that takes a long time to establish. So pretty! Gorgeous Kelly, it is funny because in the old house I planted tons of perennials to have to cut and I never went outside to cut them. In my head I was disturbing the garden and it would look like there was flowers missing. We had tons of flowers but I just couldn't get myself to cut them, foolish. I'll miss having them but not the maintenance. I enjoyed the beauty you inspire in your garden, and a cutting garden. I am inspired by your grace and beauty in gardening.